"Kolbensatz für 440 flach + 0.055″ geschmiedet, mit Kolbenringen"
Compression Height (in): 2.050 in. Are you looking for affordable high performance for your street machine? Wiseco Pro Tru Street Pistons are right up your alley! 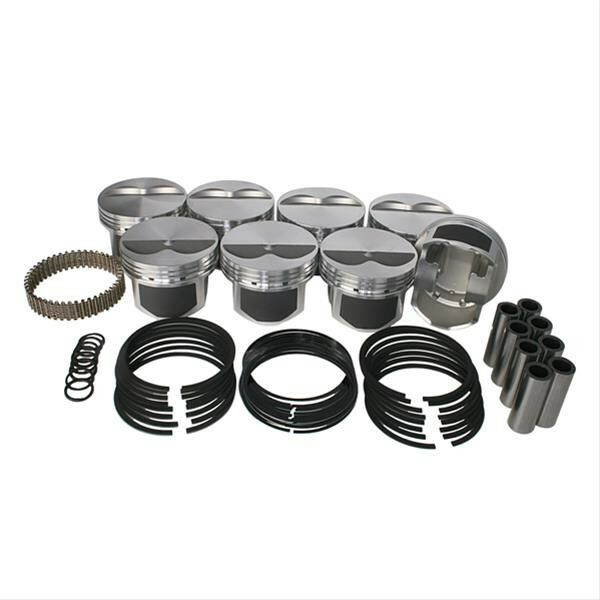 These forged 4032 aluminum piston kits are complete with chromium alloy steel piston pins and Spirolox. Oversized, symmetrical, radiused valve pockets allow for maximum flow around the valves during overlap-and accommodate oversized valves and high-lift cams. Wiseco's proprietary ArmorGlide skirt coating extends piston life, increases horsepower, reduces noise, and offers much tighter dimensional tolerances than typical spray-on coatings. Choose the set designed for your vehicle and engine application. World-class, precision-machined high performance pistons-that's Wiseco value!